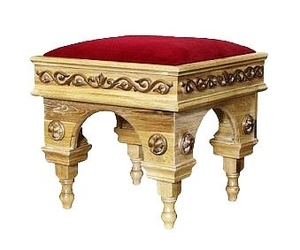 Church furniture: Clergy seat no.1-2 - Istok Church Supplies Corp.
Beautiful traditional wooden Russian-made Orthodox Church stasidi. Solid oakwood, carving, polishing, lacquering. Size: 19.7''x19.7''x18.9'' (50x50x48 cm).